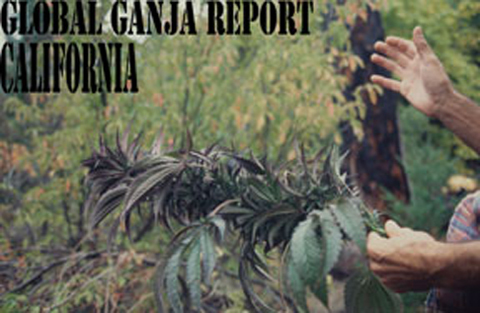 Read all about the Califonia push towards mainstream cannabis regulation at the global Ganja Report News Blog, where our intrerpid jefe, Bill Weinberg is on the scene reporting on the ins and outs of the regulation movement. Here you will find the latest, breaking news on the California legalization movement and its potential economic and politcal implications. Cannabis has been decriminalized in California since 1975. Personal possession of under an ounce (28.5 grams) is punishable by a maximum $100 fine (rarely enforced). As long as the holder has sufficient ID, he or she can't be arrested. Possession of more than 28.5 grams is punishable by up to six months in jail and a fine of up to $500 (somewhat more often enforced). Cultivation of any amount of marijuana is punishable by up to sixteen months in state prison (definitely enforced). The Compassionate Use Act of 1996--passed by popular vote in the historic Proposition 215--effectively legalized cannabis grown or consumed for medical purposes. Prop 215 did not set any limits on the amount of marijuana patients may possess and/or cultivate, but standards were established by Senate Bill 420, which took effect Jan. 1, 2004. Under the guidelines, qualified patients and/or their caregivers may possess up to eight ounces of dried cannabis and/or six mature (or 12 immature) plants. These limits were struck down by the California Supreme Court in 2010's People v. Kelly, and now cities and counties generally set their own standards. The medical-marijuana ID card system established by SB 420 remains in place. Even before the ruling, larger quantities were allowed with a doctor's recommendation--which is needed for any amount. Larger quantities were also allowed at the discretion of county authorities. Humboldt County guidelines allow patients a 100-square-foot garden and three pounds with no plant number limit. The law also permits coops or collectives of growers, as long as they keep records indicating that the crop is all for patients with a legitimate medical use. However, the state authorities have not always been scrupulous about honoring the law. June 2008 joint state-federal raids in Humboldt County's Lost River area, dubbed "Operation Southern Sweep," seized an estimated 10,000 plants--including 35 from a medical marijuana garden. The feds, of course, do not recognize California's medical marijuana law, and state authorities have unfortunately not been aggressive about supporting medical cannabis providers busted by the DEA. Gov. Arnold Schwarzenegger has called for study and debate on legalizing and taxing California's biggest cash crop--while stopping short of explicitly endorsing the idea.